Q. Assess your play today. ROGER FEDERER: I think it was a bit sort of up and down maybe. I think it's always tricky against Benoit, because I think one another, there's a lot of tactics going on. Never quite the same point. Sometimes he plays very deep in the court, then he plays up in the court. That's maybe why you draw errors out of each other rather than winners at the end. The match maybe doesn't look at good. Plus he covers the court very well. Sometimes you have a tendency to overplay, as well. But overall I'm happy. I think it was not a bad performance by any means by me. I can be pleased, so it's all good. Q. Have you changed your approach this year at all in terms of training from Wimbledon on? ROGER FEDERER: From Wimbledon to here? ROGER FEDERER: Compared to last year? ROGER FEDERER: Well, I mean, not that much. I think it all depends on how the grass court season, how tough it was. This year, the grass court, in some ways, season was almost tougher than last year's, even though I ended up winning Wimbledon and Halle. Did I win Halle? I forgot (smiling). I did. So this year playing a lot of matches leading into the grass, plus the tough five-setter I had against Anderson, it takes more out of you than going straight sets at Wimbledon. I didn't want to get hurt coming into the Open. So less was more for me this year. I think also knowing ahead of time for the clay court season that I was not going to play, I could plan that schedule also much better. I think I could have played obviously Toronto no problem, but I was just worried it was going to be a bit too much tennis. Honestly, I also have a family which I always want to take care of, want to spend some quality time with. I don't want to travel throughout the globe all the time and just play, play, play. It also depends on what the coaches say, fitness coach says. My feeling tells me. What Mirka also feels and thinks. Q. Over the last several years, you've heard the R word, retirement, over and over again from tons of people. How has your approach to hearing that and thinking about it evolved since the first time you heard it? The thing is maybe I can tell you guys, I will not tell it to one journalist in that one moment. I don't think I'm like that. I would first check with my family. If the team and everybody thinks that this is it now, and I feel it's truly that, I wouldn't probably tell it to that one journalist just it happened I was doing that interview that day. It's been in phases. Sometimes you wonder why they ask you again because do they not hear what I said yesterday? Do they not listen to what I said two months ago? At this point I take it with a smile and I understand that everybody is just doing their job, I guess. Q. You play Nick Kyrgios next. John McEnroe Monday night asked you if you were the guy to pull him aside and talk some sense into him. You said that's not your role. Why do you feel that's not your place? You mentioned it was almost an insulting question to Nick, that he needs someone to take him aside. ROGER FEDERER: That's what John thought. I don't know what to tell you. I think a player can always ask any other player for advice, then it's the player's choice -- the other player's choice to give advice or not. It doesn't necessarily have to be an older guy or anything. It could be just I'm playing Nick tomorrow, I can ask Robin Haase, What do you think about how Nick plays? Yesterday I practiced with somebody who asked me, What do you think about my game? I give advice. I think we do it all the time as players. In Nick's situation, I don't know what to tell you. I'm sure he asks around. He's a clever guy. He knows what he needs to do to get to winning ways. He's won his two matches here, so things are going well for him. I think it's more of a hypothetical question which only stirs up stuff that we shouldn't be talking about. Q. Three matches versus Kyrgios ended 7-6 in the third set. Are you hoping the umpire will not come down from his chair if Kyrgios is not trying his best and he's down one set and one break, like it happened today? ROGER FEDERER: That won't happen. ROGER FEDERER: You think it's going to happen again? ROGER FEDERER: I'm asking you the question. Do you think it's going to happen again? Q. I don't think it will. ROGER FEDERER: Exactly, there you go (smiling). Q. You understood my question? ROGER FEDERER: I understood your question. You understand my response? It will not happen twice in a row. Q. What do you think about what happened today? ROGER FEDERER: It's not the umpire's role to go down from the chair. But I get what he was trying to do. He behaves the way he behaves. You as an umpire take a decision on the chair, do you like it or don't you like it. But you don't go and speak like that, in my opinion. I don't know what he said. I don't care what he said. It was not just about How are you feeling? Oh, I'm not feeling so well. Go back up to the chair. He was there for too long. It's a conversation. Conversations can change your mindset. It can be a physio, a doctor, an umpire for that matter. That's why it won't happen again. I think everybody knows that. 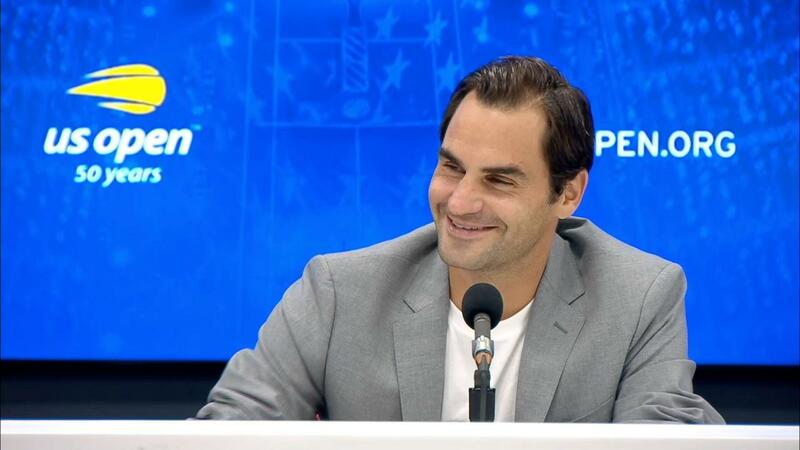 ROGER FEDERER: Love those (smiling). Q. The Roger Federer sitting here right now plays the Roger Federer who won the 2008 US Open, who would you give the edge to and why? ROGER FEDERER: Well, I really hope that this guy would win today just because I feel like I've improved many things over the years. I'm a more complete player than I was back then. I feel like the game has evolved, as well. Serving bigger. I don't know. It's just a different game today. I always feel the next generation is always better than the past one, yeah. Q. When Nick a little while ago was asked about what your greatest strength was as a player, he said your return of serve slice. No other player has a shot like that. Without that, you would not be where you are. Could you comment on that. ROGER FEDERER: Yeah, I mean, thanks for the compliment. I don't know. I still feel like probably other shots have won me my tournaments than my backhand slice return. But it's part of an entire game that I have. It just came natural, I guess. It's also parts of maybe reading serves, reading service motions, reading ball tosses, having an idea where the guy is going to go, and then when I'm on the ball making it time and time again. Again, I think every player feels different about certain opponents. Me also, I read the different serves differently, yeah. Q. When you train to go into all these tournaments, do you do anything different to prepare for the heat than you would do ordinarily? And what is your favorite cold drink? ROGER FEDERER: Favorite cold drink? ROGER FEDERER: Okay. It's very connected, I like it (smiling). When it's hot, I like to drink cold water. This year I came really early to New York to prepare before Cincinnati because I felt like it's maybe one of these years where it could be hot. I had the plan to go to Dubai first, where it's extremely hot. I didn't want to be away from the family. I changed plans. Said, Let's go early to America and prepare over here in the conditions that I'm actually going to see during the Open. I think there is no substitute for playing in humidity or in heat. You just got to do it. If you train in the cold all the time, all of a sudden it hits you, the humidity and heat. You're just not ready. I don't care how fit you are, what you're used to, the humidity can really get to you. I think that was a good choice. In terms of a cold drink? I like cold sparkling water. I like a nice glass of champagne. Yeah, I like that, a nice drink. I don't know. A lot of cold drinks, yes. It's got to be cold. I don't like warm drinks, let's put it that way.